Ex-head of Udmurtia faces final corruption charges | Russian Legal Information Agency (RAPSI). 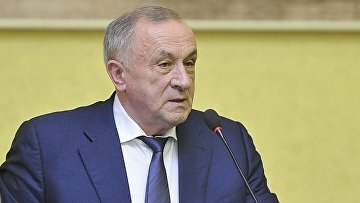 MOSCOW, April 3 (RAPSI) – The former head of Russia’s Udmurt Republic Alexander Solovyov has been presented with final charges of taking over 140 million rubles (about $2.5 mln) in bribes, the press-service of the Investigative Committee has stated. According to the statement, investigation into the case is nearly complete. During the hearing held in May 2017, a prosecutor said that the former governor pleaded guilty and started cooperating with investigators. Solovyov’s lawyer confirmed that his client is cooperating with investigators. On April 26 of the same year, the defendant said that he had “violated the law” but did not clarify what he meant by that. According to investigators, in 2014-2016, Solovyov received bribes amounting to 139 million rubles from representatives of organizations behind the construction of bridge crossings over the Kama and Buy rivers in the Udmurt Republic. Allegedly Solovyov also received share worth 2.7 million rubles (about $48.2 mln) in a commercial organization. The defendant was supposed to ensure extraordinary and immediate payment for construction services from the federal and regional budgets. He was also to allocate licenses for geological exploration and resource extraction. On April 4, 2017, Solovyov was relieved of his position on decree of Russian President Vladimir Putin. 12:00 03/04/2018 The former head of Russia’s Udmurt Republic Alexander Solovyov has been presented with final charges of taking over 140 million rubles (about $2.5 mln) in bribes.